has been popular for quite a while now. It’s way cheaper than buying a brand-new kitchen. And you can almost get the same effect as a new kitchen. Just simply the change will give you that new kitchen look. 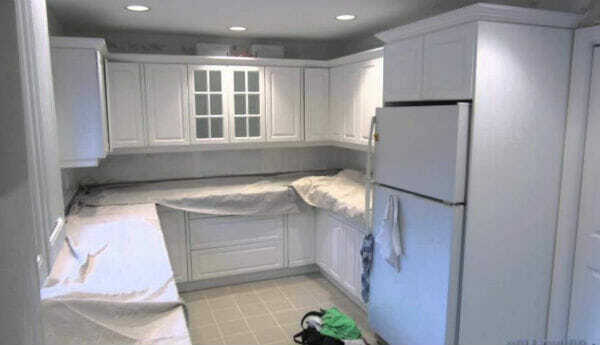 Don’t forget just simply the money spent on the new kitchen (cabinets that is) will cost a tidy sum of money. Even the smallest kitchens can run about $2000 I mean this is a small kitchen and if you start building a large kitchen with a lot of cabinets and cupboards and drawers you’re looking at a lot more invested money. also involves construction type work that could run into a few days with the downtime for your kitchen and the mess it makes. First of all the kitchen has to be demolished (messy dusty) you will have to do some drywall repairs where the cabinets were and most probably will have to repaint the walls in the kitchen. But with by simply doing some kitchen cupboards painting you have saved all this money on your home improvement plan. This money can spend in other places likewise to update your home such as your bathrooms for example. These are all cost-intensive projects. Even the washroom vanity is very similar to kitchen cabinets painting since they are almost the same thing. When Mississauga handyman services come in to do your kitchen cabinet painting you will have no downtime with the kitchen. You will be able to use it in most cases without any interruption or access to it. It is strongly advised that this is not a DIY project unless you don’t care how your room cupboards look in the end. To acquire a factory look type finish you need to hire professional painters in Mississauga who have years of experience painting hundreds of kitchens cabinets. Which choice are you more comfortable with? Replacing your entire kitchen for a lot of money anywhere from $2000 or $3000-$20,000 and put up with the discomfort for possibly a week or 2. Or have our staff come in and do all your kitchen cabinets painting in just a day or 2 at a small fraction of the cost and still be very pleased with the outcome.